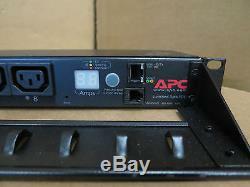 APC AP7921 16A, 208/230V PDU Rack-Mountable Power Distribution Unit 1U 8 x C13. In Good Condition, Full Working Order, Reset to factory default. 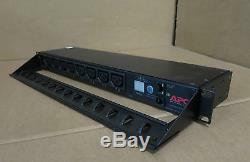 APC AP7921 Rack PDU, Switched, 1U, 16A, 208/230V, (8)C13. Power distribution that remotely controls power to individual outlets and monitors the aggregate power consumption. Nominal Output Voltage: 208V, 230V. Maximum Total Current Draw per Phase: 10A. Output Connections: (8) IEC 320 C13. Nominal Input Voltage: 208V, 230V. Regulatory Derated Input Current: 12A. Cord Length: 6.5 feet (1.98 meters). Number of Power Cords: 1. Maximum Input Current per phase: 15A. Net Weight: 5.00 lbs. Maximum Height: 1.73 inches (44 mm). Maximum Width: 17.50 inches (445 mm). Maximum depth: 4.25 inches (108 mm). Operating Environment: 32 - 113 °F (0 - 45 °C). Operating Relative Humidity: 0 - 95%. Operating Elevation: 0-10000 feet (0-3000 meters). Storage Temperature: -13 - 149 °F (-25 - 65 °C). Storage Relative Humidity: 0 - 95%. Storage Elevation: 0-50000 feet (0-15000 meters). Please call 020 8882 1111 from UK or +44 20 8882 1111 from outside the UK. VAT IS NOT PAYABLE BY PURCHASERS OUTSIDE THE European Union (EU) AND by purchasers in the EU (excluding UK) who are VAT registered. 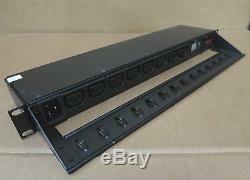 The item "APC AP7921 16A, 208/230V PDU Rack-Mountable Power Distribution Unit 8 x C13" is in sale since Tuesday, March 29, 2016. 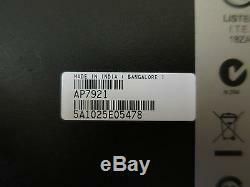 This item is in the category "Computers/Tablets & Networking\Power Protection, Distribution\Power Distribution Units". The seller is "itinstock" and is located in London.